Detailing the physical features, habits, territorial reach and other identifying qualities of the Spider Wasp (Entypus). Large enough to take down a formidable arachnid opponent, the Spider Wasp uses all of its advantages to feed its offspring. This species of Spider Wasp has a sleek, blue-black body. 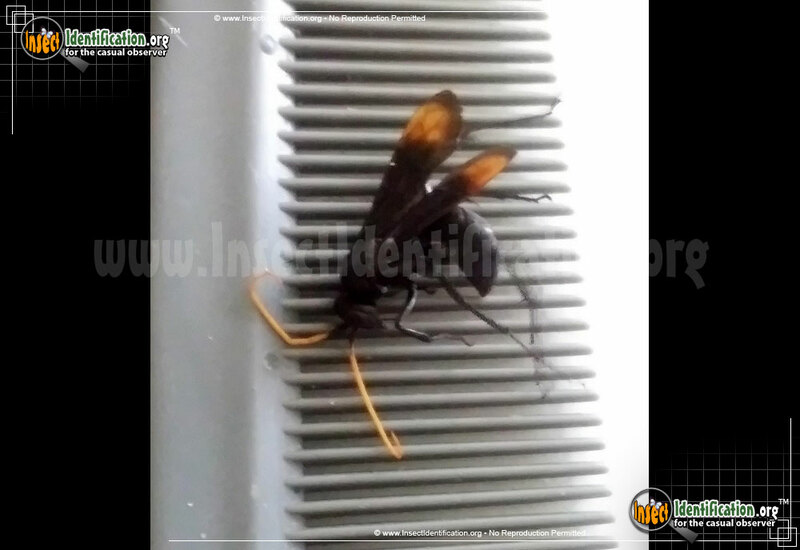 Dark wings are tipped in orange, and bright yellow-orange antennae add warning coloration. Attributes like its large size, stinging power, and strength allow the female wasp to take on spiders of similar or perhaps larger size, and win. Males are not as large. Adults drink flower nectar. Attacking from flight helps give the female wasp a tactical advantage. After a short tussle, when the Spider Wasp manages to overtake the spider and sting it, paralysis ends the scuffle. The female wasp then grabs the immobile spider and brings it back to a ground burrow that may have once been home to a rodent. At the end of this burrow is a deep cell or chamber carved out in advance by the female. While depositing the spider there, she lays a fertilized egg. Once her egg hatches, the larva begins eating the spider while it is alive, but still paralyzed. Once the larva grows large enough, it pupates in this cell over the winter, and emerges as a winged adult in the early summer. Because females lay many eggs in a season, they must collect multiple spiders as food stores. This usually means that their appearance is a bit haggard and worn out by the end of summer thanks to many victorious battles. Look for this species of Spider Wasp in lots, fields, parks, and other open areas.